Every year my husband and I fill each other’s stockings. While this is very practical, it is not much fun to get a bunch of gum, razors and deodorant on Christmas morning. Last year I gave him some cookies too, but it was still kind of boring. Then the Hubs went outside of our tradition and bought me tickets to a live show at a local theater. This got me thinking, what could I do to surprise him? I am not much of a shopper these days. I prefer to shop mostly online to avoid the crowds and stress of the holiday season. 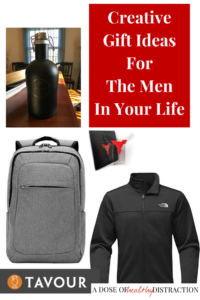 So I went on a search for some useful, but fun gifts that the Hubs (and hopefully your partners) will enjoy. All of which are available online. Please see my full disclosure. 6 pack insulated beer tote, in case he wants to share with friends. Cord Taco – for when you have multiple devices. Leather Catchall Tray. This looks good sitting right on top of the dresser or even on a desk. A new Beanie – Gotta love a man in a beanie! Warm Layers – for when you are shoveling snow but you still want to look good. If you have never played this game you must start! There are now several add-on sets of cards available. Again, these are affiliate links. Please see my full disclosure policy. Not everyone is as obsessed with Amazon as I am. So here are some recommendations straight from the Hubs. It’s like a shopping service for specialty beers. You can hand-select bottles and add them to your cart. Tavour is a great place to find small-batch, rare brews. I also recommend Home Wet Bar on Etsy. 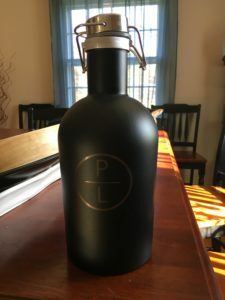 I purchased a personalized growler from them and he loves it!